When it comes to cooking, Eggplant is most commonly prepared like a vegetable, even though botanically speaking, it’s technically a berry. You probably won’t find us eating raw eggplant like we would raw blueberries any time soon, but we’re definitely going to try Adam Kenworthy’s Stuffed Eggplant ASAP! Gather up the following ingredients and then follow the instructions below to give this dish a try. Keep in mind, Adam is a big fan of cooking to taste so many of the ingredients are not given with exact measurements. Add more or less of each ingredient depending on your own tastes and what you prefer. This is how you learn to cook! To start, pre-heat your oven to 400 degrees, then cut your eggplant in half and score the meat before placing it on baking tray. Whisk together all of the marinade ingredients and pour the mixture over your eggplant. Roast the marinated eggplant until softened and golden brown. About 25 to 30 minutes. Next, cook your quinoa according to the package instructions. While the Quinoa and the Eggplant cook, begin chopping and sautéing your other veggies (Shallot, Shishito peppers, Romanesco). Add your sautéd veggies, and fresh herbs to the quinoa and toss in a drizzle of coconut vinegar and a drizzle of coconut aminos. Add salt to taste. 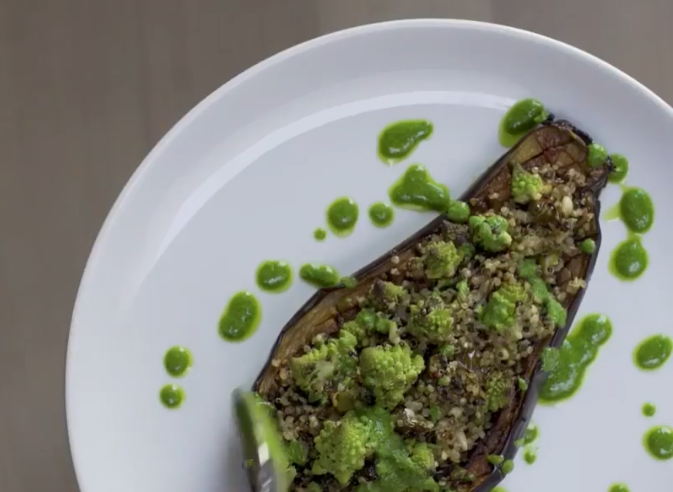 When the eggplant is ready, plate it and top it with your quinoa mixture and pine nuts. Top with a chimichurri. (optional) and enjoy. 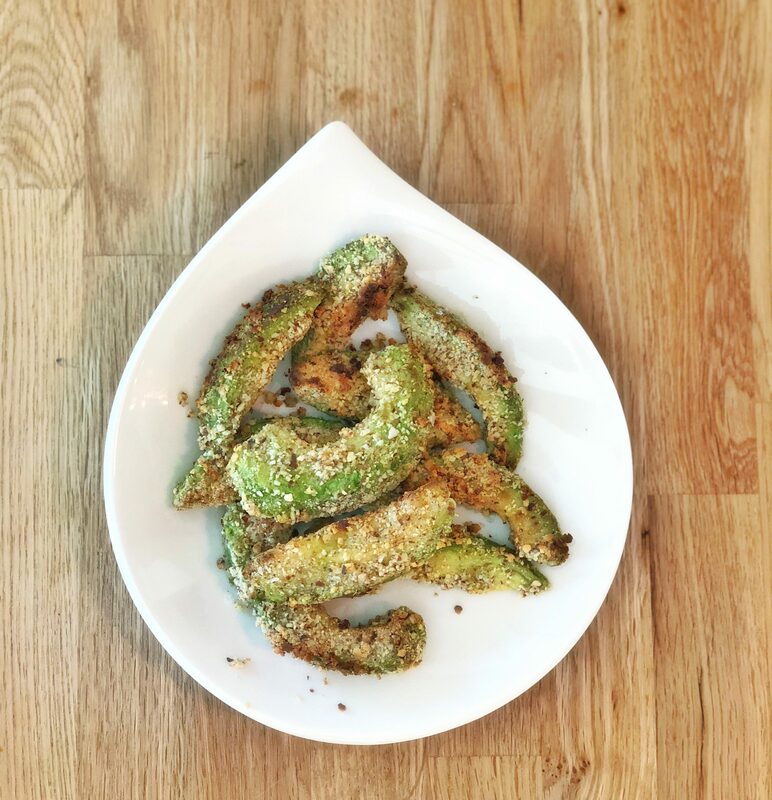 I love avocado and I’ve heard about Avocado Fries but never managed to try them. So I figured that I’d see if I could make them. It was the perfect test for my new Air Fryer. First, let’s talk about fried food. I have to say that as an average American girl I grew up on french fries, onion rings and various other deep fried foods. So I have a nostalgic taste for those unhealthy greasy bits of crispiness. Once I was teenager and got conscious about the impact of fried foods on my health, my diet and my skin I stopped eating them so often. But the love has never left my heart. I tried fried plantains that a friend made in her air fryer and I could not believe that they weren’t deep fried, so I searched for a good Air Fryer and got one. They’re not too expensive for a kitchen appliance. Well sure, you can get the super expensive luxury version, but really they’re all the same. Mine cost about $60 and I got it on Amazon. Truthfully, what I was most interested in when choosing is that the color matched the rest of my kitchen (white). Ok, now on to the avocado fries. These were really easy to make and with the Air Fryer the clean up time was minimal. If I’m going to cook something it has to be quick and easy. While I respect and love when people take the time to go through multiple steps and put in hours in the kitchen, it’s just not me. Another thing about me is that I’m an improviser, not a traditionalist when it comes to recipes. If I want to make something that I haven’t before I often do a quick google search for recipes to get the general gist of what the process is like. Then I usually see what’s in stock in my pantry and go from there. The avocado you choose for the frying process should be ripe but firm. If it’s too mushy to stay together on its own, the wedges are going to fall apart in the fryer. Most avocado fry recipes will call for Panko or some other form of bread crumbs. I do not usually keep bread crumbs as a staple in my kitchen, so I had to substitute something else. I used almond meal instead and it ended up giving the crust coating on the avocado a nice flavor and an added health punch too. The other thing many recipes say is really important when it comes to making fries in the Air Fryer is that the avocado has to be coated in something to make the breading stick to it while it’s frying. The most common option suggested is aquafaba for a good vegan substitute for egg in the prep stages. While I did have a can of chickpeas, the idea of opening the can and draining out the liquid just didn’t appeal to me (can someone please make aquafaba that you can just buy and have handy without having to drain chickpeas? See what I mean about my need for things to be easy in the kitchen lol). I did for a moment think about making falafel in the Air Fryer with the chickpeas (and I still might) but I figured it was a good idea not to get ahead of myself in my lazy kitchen persona. So, again, I improvised. Instead of aquafina I coated the avocado lightly in olive oil. This worked surprisingly well to keep the almond meal attached to the avocado during the air drying process and they stayed on after while I was eating them. Overall I was pretty happy with the result. Now some people wouldn’t call these real fries. Ok, point taken. But they are quite yummy. That’s why I called my recipe Almond-crusted Avocado Crispies instead. Something really cool happens to the avocado in the Air Fryer. The almond meal on the outside gets crispy and then the outer layer of the avocado turns into a kind of protective layer and changes color ever so slightly. Then, the inside is the warm juicy super green avocado that seems to get even more creamy in contrast to the crispy layer outside. I’d recommend sprinkling with a finely ground sea salt, either in the crusting stage or immediately after they’re ready. You could eat these on their own and serve with an aioli or even plain old ketchup and mustard. Or, they’d be great to top off a salad to add another layer or richness. 1. Grind up a small handful of almonds with a pinch of sea salt and place in bowl. I used soaked and sprouted almonds because I’m obsessed with sprouted nuts. I used my Vitamix blender on the dry setting to pulverize the almonds. You could use ready made almond meal if you have it or roasted or raw almonds, or really any nut works. I’m thinking of trying it with Macadamia nuts next time. And of course you could also use bread crumbs. If you’re sensitive to salt you could wait to salt them until after. 2. Cut one whole ripe but firm avocado into bite-sized wedges. 3. Lightly coat the avocado in olive oil (or aquafaba). 4. Place the avocado in the bowl with the almond meal and gently coat each piece with the almond meal. 5. Line the bottom of your air fryer basket with the coated avocado pieces and get ready. 6. Turn the Air Fryer on 390F and set the timer for 10 minutes. At 5 minutes you might want to shake them or turn them over. 7. Reach gently into the Air Fryer with tongs and collect your avocado crispies. One small thing to note is that if you haven’t used an Air Fryer before they get really hot so be careful Let the Air Fryer fully cool down before you start thinking about cleaning it. The basket can easily be washed by hand or usually put right in the dishwasher (always check your Air Fryer manual to be sure that your basket is dishwasher safe). How is it already January 2018? 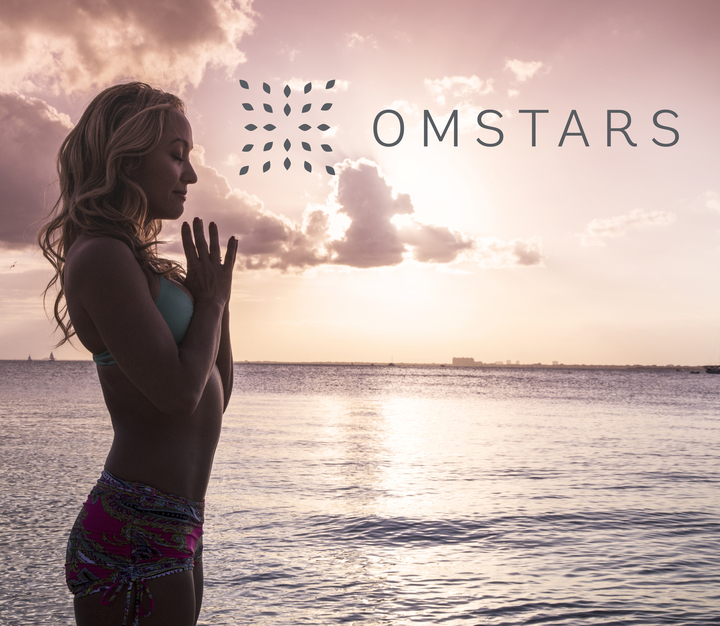 If you’re anything like most of us over here at OmStars, the new year completely snuck up on you and now you’re probably scrambling to get on top of well-intended, New Year’s resolutions to eat healthier, exercise regularly, and practice more yoga! Luckily, the internet is teeming with healthy recipes from vegan food-lovers that are delicious and easy to make. 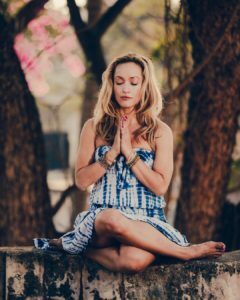 Today, we’re excited to share an amazing recipe by Natalie Prigoone, author of The Great Uncooking: Real Food, Raw Food. 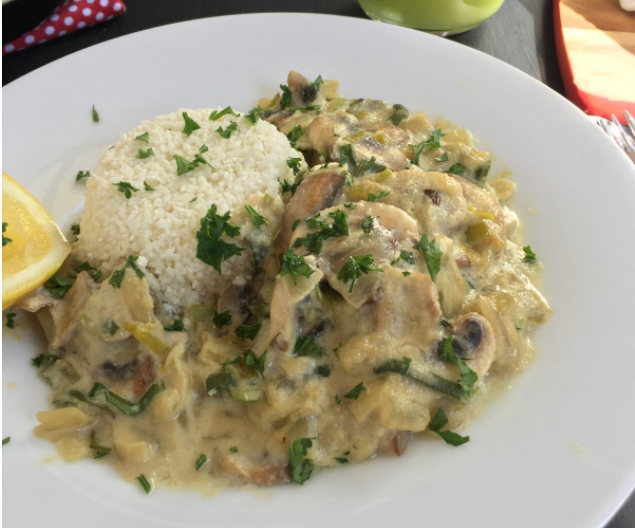 It’s a Vegan Creamy Mushroom and Leek Sauce with Caramelized Onions, served over Cauliflower rice. First, wash and chop all your vegetables. Then heat a drizzle of olive oil on low heat in a large pan, and set a small pot of water to boil. Using the pan with the olive oil, sauté your onions, mushrooms and leaks for approximately 10 minutes, taking extra care not to burn the onion. Natalie suggests adding a little salt during the cooking process to help the onions release some water. Meanwhile, pour your freshly boiled hot water into a blender with your cashews, yeast flakes, garlic and stock powder and blend until smooth. (Tip: You’ll want to make sure that you allow some steam and pressure to escape through the opening at the top of your blender by leaving the small, plastic cap on only loosely). Use a food processor to make your Cauliflower rice. Cut the cauliflower into small chunks, and process until it resembles rice. Pour your Cashew cream mixture into the pan with your sautéed veggies, stirring occasionally until the sauce thickens. Then serve the completed mixture over your Cauliflower rice, and garnish with a squeeze of fresh lemon juice. According to Natalie, this is important for balancing the palate. This recipe serves 2, and it’s is a delicious and healthy way to stay on track with your new years resolutions. Give it a try and let us know what you think! 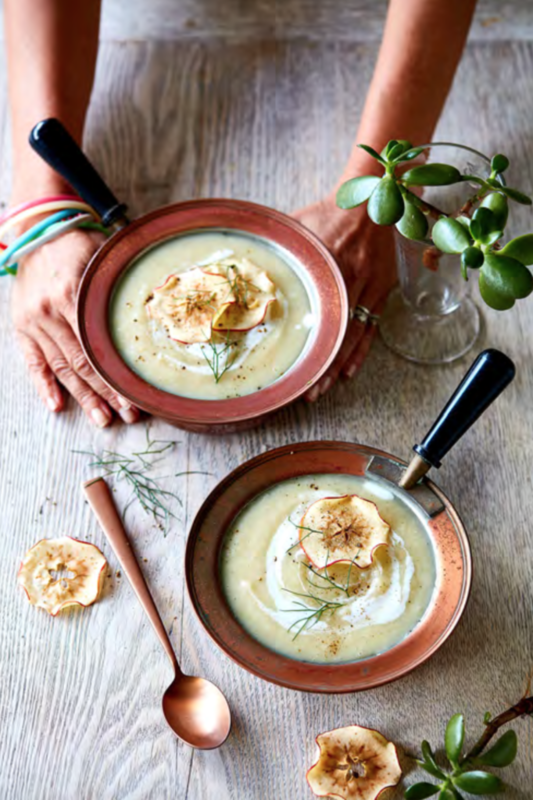 Plus, check out some of the other amazing recipes that Natalie Prigoone offers on her course, The Great Uncooking, available with your membership to OmStars.com.